When I was planning out this post originally, I planned to wear my favorite button down, my riding boots, and a hunter green skater skirt. Immediately when I put it on, I felt uncomfortable. It's not that it didn't look cute, it just wasn't something I'd actually wear to class, and it also looked like a private school girl's uniform. I stressed over it for a bit, but instead of skipping the post, I thought I'd just show you what I actually wear to class. Yes, it's less style blogger and more casual, but I thought I'd save the glitz and glamour for the professionals. When I head out to class, I want to be put together, but I also want to be comfortable and feel good in my skin. This kind of outfit is that for me. The button down is comfortable, but also classic. The plaid flats add a bit of color, but they're comfortable and practical for trekking across campus and climbing up flights of stairs. And my leggings…do I even need to explain why they're the epitome of comfort? For a bit of extra warmth, I just threw my Ralph Lauren cable knit on top since I am in England after all and it's bloody freaking cold in the morning. My tote is H&M, but you can get all of those details below! The bag: My tote bag is H&M from last fall, but the style above is this year's version! It's basically the same, except on this one, the corners are rounded. It's an excellent bag, one that I've used as a carry on twice, so I can voice for how much it holds, and it just looks very simple and chic, no matter what you wear with it! At $40, it's a steal! The necessities: Notebook, planner, pens, laptop, etc. It is school after all, so you've got to carry a few school supplies. I actually love cheap Bic pens, as weird and picky as I am about everything else, and my planner is just the standard Lilly one. I think it's the Large version. My glasses are Ray bans (style #5310) and they're tortoiseshell on the outside and lavender on the inside…I'm obsessed! The beauty backups: I always carry concealer and mascara on me, because those are usually the first to disappear! You never know when you'll need to touch up, and I don't want to be stuck somewhere looking tired and worn out, so I make sure to always have these with me. Dry Shampoo runs in that same vein, because I don't know about you, but after a day of class, my hair is pretty flat, and I like to fluff it up a bit before heading to work or out to dinner with my friends! My Pinch mini emergency kit has saved me many a times. There are so many things in there, like a deodorant swatch, a stain remover, a sewing kit, a mini tampon, aspirin, and chapstick…it's really incredible. Snack time: I want to pretend that I eat mature snacks like roasted almonds and green tea, but you know me better than that. My snacks usually consist of chocolate chip granola bars and Coke, as bad as they are for me, they always do the job! Extras: Gum is a must at all times. I'm trying very hard to stop biting my nails and when I get anxious, I try to chew gum instead of bite…it works about half the time! My rosebud is a life saver. It can be used on cuticles, dry skin, and most of all chapped lips. I tend to also lick my lips a lot when I'm nervous (I really need to chill out), and this stuff brings my lips back to life so quickly! I find that other brands feel nice when they're on, but they don't really moisturize, but this stuff does both! Wallet and headphones are obvious…ain't nobody got time to be left without those! I just recently got a Jack Wills card holder for my oyster card while I was in London, and I now use it to hold my Nottingham student ID, which is so convenient because it scans without me having to even take it out…and it's adorable! 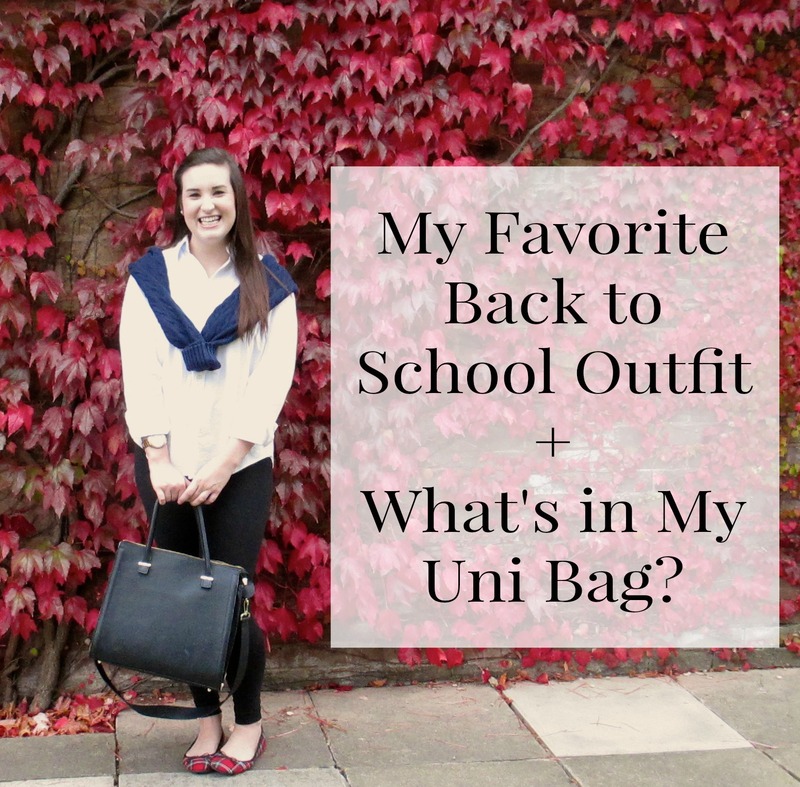 What is your favorite outfit for school and what are your "must have" school supplies?